A delightful French Victorian Perfume bottle with floral Gilt and a single Turquoise Stone set in a bezel. The Cap has a stunning filigree basketweave pattern and the original dauber is intact. Ready to enjoy your FAV perfume wherever you go! I added a Small Bronze heart suspended on a Rhinestone. 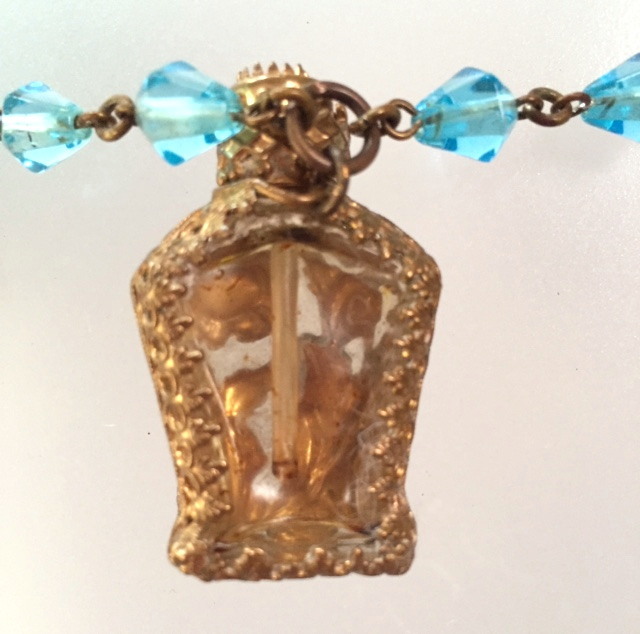 The demure scent bottle is suspended on antique French Turquoise beads finished with enchanting link chain. Necklace is 30” Long, bottle is 1.5" tall.